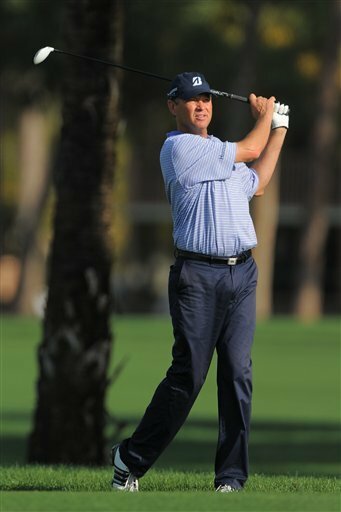 Davis Love 111, leads the suspended first round of the Honda Classic at PGA National Golf Club Champion Course, Palm Beach Gardens, Florida. Play for round 1 has been suspended due to darkness, round 1 will resume at 7:30 am local time. Davis fired an opening round of 64, for a -6 under par total. Davis had a hole in one at the 5th, and was pleased to get off to a good start; "Yeah, a hole-in-one is a good start. I knew starting when we were on the range this morning that scores, the early scores, were going to be better, and you'd better get off to a good start. I was parring along there, had some birdie putts, and had not made a birdie yet. Then all of a sudden, I was 2-under. So that was a big boost. I obviously hit a good shot but you're lucky when they go in. But that was a good boost and then to hit a good drive at the next hole and have a birdie putt and then birdied three in a row, that was a really good start the first nine. Wasn't quite as good on the back. But we all know how hard the back is. Missed a couple fairways. Hit a bad 4-iron into 10 and made a bogey there. Finished nice, and I played the par 3s real well obviously. I was 4-under on the par 3s with a missed 6-footer so that was the key. I hit good iron shots on all of the par 3s. They can be very dangerous. They were all three 5-irons and a 7-iron. They were all 200 or less, which is nice; sometimes they can be 230. But I hit the ball really well all day except for a couple of tee shots like I said." 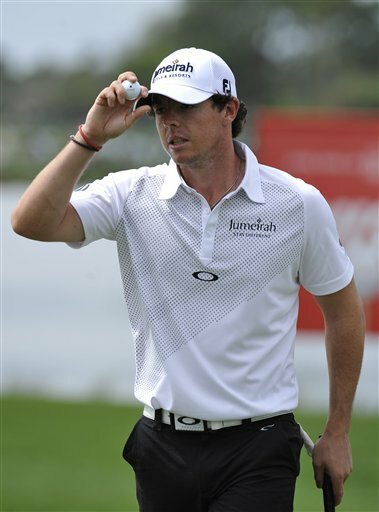 AP There are a plethora of players at -4, including Rory McIlroy, Justin Rose and Korea's Seung-Yul Noh, to name just a few. Because of the soft conditions, lift, clean and place on the fairways was the order of the day, a real boon to help the players shoot low scores. Unfortunately it did not assist Tiger Woods, he ended his round at a disappointing +1, with another poor putting performance, something that is becoming a sad habit. 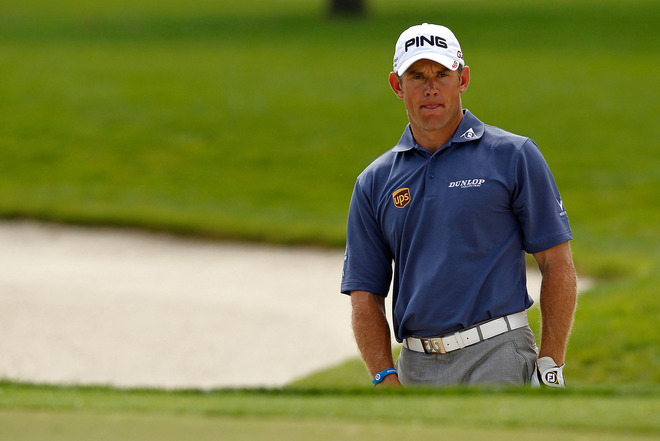 Lee Westwood fared little better with a first round of par 70, and needs a good second round tomorrow to get into contention. Getty Images Rory McIlroy was also very pleased with his round; " Yeah, I mean, it is a solid opening round, especially on a course like this. Any time you shoot 66, you have to be pretty happy. Felt like the course was very scorable this morning. It's obviously very soft after the rain. With lift, clean and place on the fairways, if you can put your ball on the fairway, you have a lot of chances to score with these soft greens. So I felt like I played very nicely. Only made that one mistake on the 8th green with a 3-putt. But apart from that, I was very happy with how the day went." AP Justin Rose was replying to a question about his emotional state after a double bogey on his second hole; " Well, I guess the key was there were not any emotions to the double. That was the key to the eagle. Obviously it was so early in the round; it was one poor swing. It was a tee shot that required a draw, and I tried to really commit to it. I've been losing a couple tee shots to the right and that's what happened there. Yeah, didn't let it affect me obviously. Came back from there, played really, really nicely the rest of the day. Holed a couple nice putts on front nine but really had a lot of chances on the back nine to take it a little deeper but overall great start to the tournament." Tiger said of his putting performance; " I hit a lot of pure putts today. They rolled over a lot of edges. They just didn't quite go in. But wasn't disappointed with my lines. A couple bad reads out there. The grain kind of snagged it harder or less than I expected, but overall I hit the ball very good with my putts. They are hard to hit the putts hard enough for me. I find that they look faster than they are putting. I had to get committed to hitting the putts harder and getting past the hole, and when I start doing that, I will make the putts. But consequently, I also 3-putted one, too. I whipped it by there."